ThatCable HDMI review | What Hi-Fi? OK, so some people still need convincing of the worth of decent cables. 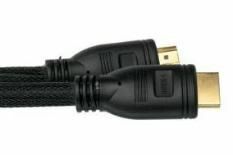 If you're one of them, and you're still using the bit of HDMI cable that came free with one of the components you recently bought, here's our advice: go to ThatCable.com and purchase this HDMI cable for a fiver. If that doesn't set you on the path of improving your cables, we don't know what will. Compare the ThatCable HDMI to the free stuff, and you'll immediately see – and hear – a big improvement. Pictures are more stable and motion more assured, while even colours are a little more vivid and exact. Sound has more scale and detail, too. This will give rivals up to about £20 something to think about.